Theresa M. Jones: Teaser 9- Whack! That night, I dreamt of harpies taking babies to a volcano. My brain was so whack sometimes. Publication date is only a couple weeks away. When seventeen year old Lily finds her parents brutally murdered, leaving her broken and alone, she is determined to bring justice to the fairies responsible. Her quest leads her to infiltrate The Empyrean, the land of the Fae where terrifying creatures lurk in every shadow. But with a political rebellion mounting, bloody battles and foreign enemies stand in her way. Alec, a mysterious fairy keeping his own secrets, gradually becomes her guide and dear friend in the unfamiliar world, and restores her faith in love. Disturbing secrets about her parent’s true identity are revealed, causing her to be more involved with the devastating fairy war than she can afford. Her vengeful mission becomes compromised and her growing romance with Alec wavers. She must conquer her fear of the unknown, ignore her grief, and overcome her growing list of enemies if she is to succeed in avenging her parents’ death. Or ever make it out alive. 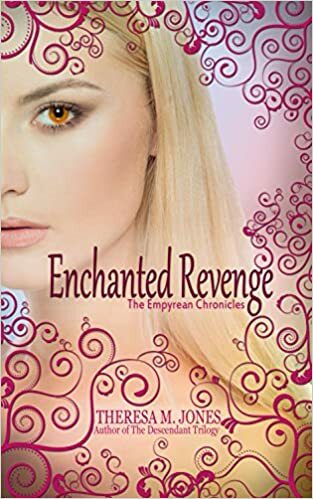 Enchanted Revenge appeals to fans of Julie Kagawa and Jennifer L. Armentrout. This is a full length novel, and is the first in the four-book Empyrean Chronicles. It is a YOUNG ADULT urban fantasy, and has some mild sensuality and language.